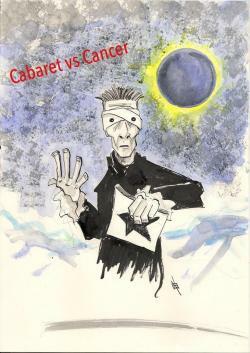 I would like to receive occasional information and updates from Cabaret Vs Cancer and jumblebee. 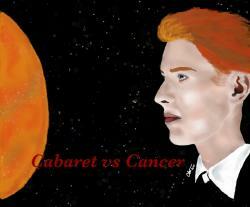 On March 1st 2017 Cabaret vs Cancer will stage the second annual cabaret tributes to David Bowie. Alongside these events we are holding our second charity auction. 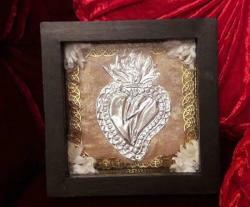 All artworks have been donated and all proceeds are donated to charity. You will be required to pay actual shipping cost for your winning lot and we will ship INTERNATIONALLY! Minimum bid is £14 (Bid increments are £2). 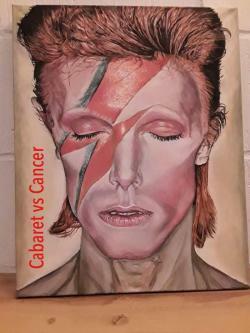 j(ay) has been a supporter of the charity since 2016, this is his second year contribution to our Ashes to Ashes auction. 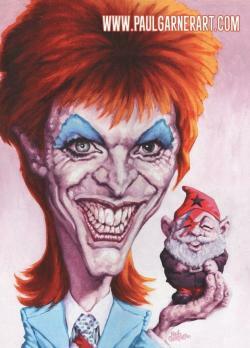 j(ay) has done illustrations for several books (Alice in Wonderland, Edgar Allan Poe, Voltron and Wizard of Oz) and provided sketch cards for licenses such as Marvel Comics, Mars Attacks, LucasFilms, 20th Century Fox and even The Man Who Fell to Earth (which had Bowie autograph cards), among others. 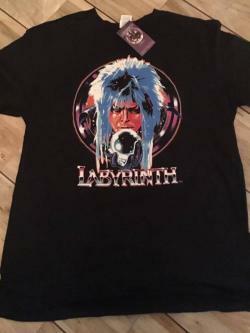 This black tee shirt is an official Jim Henson/Labyrinth tee shirt. Minimum bid is £52 (Bid increments are £1). 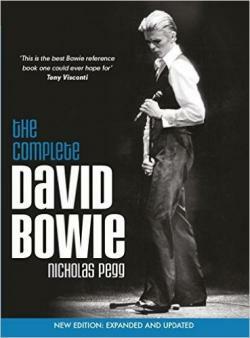 The author of this ultimate book of Bowie, Nicholas Pegg, will personally dedicate a copy of the book to you (or a person you nominate). 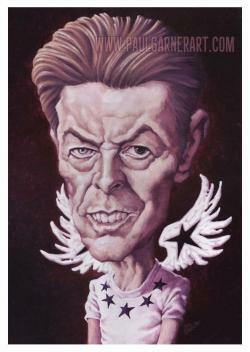 THE COMPLETE DAVID BOWIE is the first book to cover every facet of Bowie's career in revealing depth and detail. In his research for this benchmark book, Nicholas Pegg has used a host of sources, many of them previously unpublished. 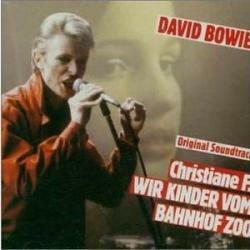 Every recording is analysed from a technical and musical point of view, as well as being judiciously placed in the context of Bowie's mercurial career moves and constantly refined creative intentions. 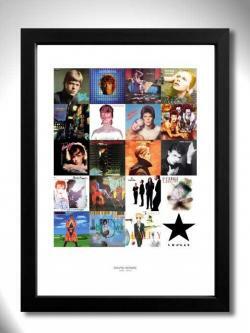 The A-Z of songs and the day-by-day dateline of Bowie's career are the most complete yet published. * THE ALBUMS - detailed production history and analysis of every album from 1967 to the present day. 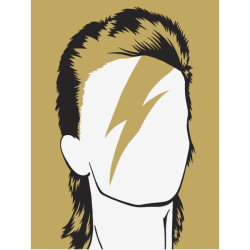 * THE SONGS - hundreds of individual entries reveal the facts and anecdotes behind not just the famous recordings, but also the most obscure of unreleased rarities - from 'Absolute Beginners' to 'Ziggy Stardust', from 'Abdulmajid' to 'Zion'. * THE TOURS - set-lists and histories of every live show. 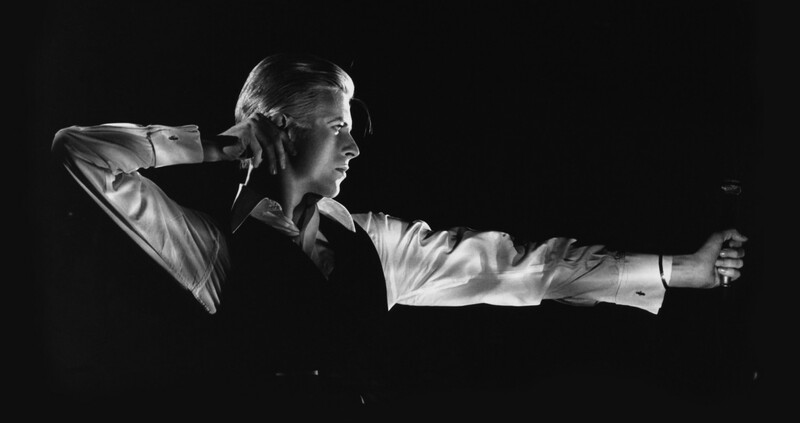 * THE ACTOR - a complete guide to Bowie's career on stage and screen, including many obscure and little-known performances. * PLUS - the videos, the BBC radio sessions, the paintings, the Internet and much more. Minimum bid is £46 (Bid increments are £2). You are responsible for your own travel, appointment to be arranged directly with Frank and his team, at a time convenient to both parties. After the auction closes, you will be emailed details of how to claim your prize. Minimum bid is £62 (Bid increments are £2). 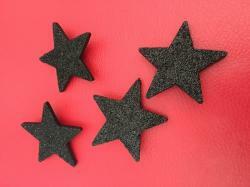 Minimum bid is £7 (Bid increments are £2). Chiara is an Italian-born novelist, painter and performer living and working in Cardiff. She has published three novels in Italian and German, Currently working on a fourth, and regularly do live performances of poetry, spoken-word and singing at various events in Cardiff. 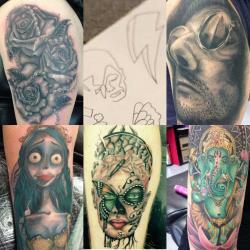 Anyone interested in Chiara's work can get in touch privately through twitter or facebook. Minimum bid is £29 (Bid increments are £2). Unique Hand crafted individual designer wall lamps. No two are the same. 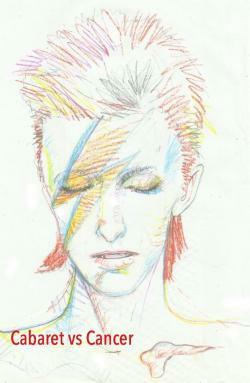 This auction is for the 'ziggy' period image in a darker frame (eyes closed). Hand made in Yorkshire from real glass & wood. - approx 1ft sq. x 3" deep. Light source: 20x LED bulbs powered by 2x AA long life batteries, so no trailing wires or plug sockets needed. Minimum bid is £22 (Bid increments are £2). Irish illustrator and painter living in London worked in advertising and design now full time artist in film and comic industries. 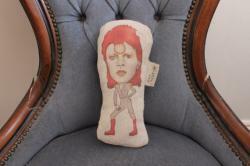 This David Bowie Ziggy Stradust Inspired doll is perfect for any fan, for display, to play with or cuddle. All characters have been drawn by Dolly and printed onto 100% cotton canvas. This doll is a part of the ‘Musicians’ Series. Minimum bid is £42 (Bid increments are £2). You are responsible for your own travel, appointment to be arranged directly with Craig and his team, at a time convenient to both parties. Minimum bid is £151 (Bid increments are £1). Ben, a graduate of the Liverpool School of Art, has been painting for over fifteen years, has a unique brand of confrontational punk queer art. 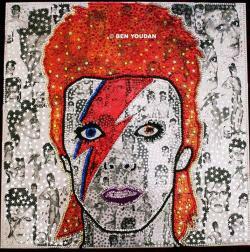 Fascinated by the dark and tawdry side of popular culture, Ben explore sexuality and the notion of masculine identity. 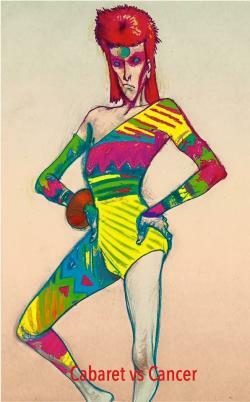 To say that Bowie was an influence on his visual sense would be a massive understatement. Media - Collage, acrylic paint, sequins, glitter artificial gems, PVA on canvas. An unframed print of an original pencil drawing by Lee Evans. Printed on pro paper. Measuring 21cm x 29.7cm (A4). Hang on to Yourself w by Jo Wenlock. A giclee print matte poster paper A4 with a white border. 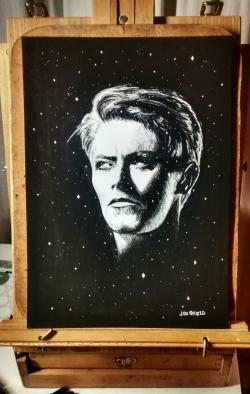 Jo has recently returned to art after a 25 year break and is a huge fan of Bowie. 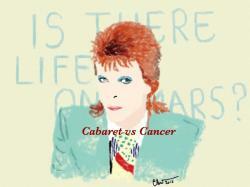 She recently coordinated Burning 4 Bowie, raising money for Cancer Research. Minimum bid is £12 (Bid increments are £2). Planetpop specialises in painting alien beings in kitsch style – tacky and fun with glitter thrown all over! 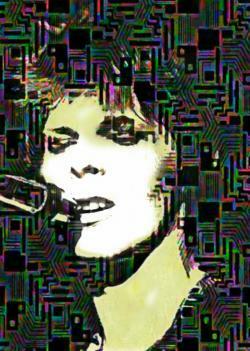 However, there was no need to “alienify” this icon, Ziggy Stardust was of another planet so he has been painted in his original disguise. 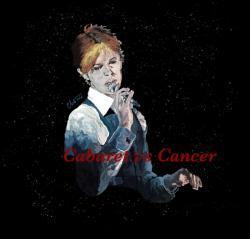 A3-size (420 x 297mm) giclee print on semi-gloss art paper. 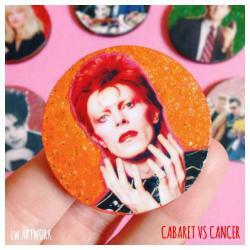 David Bowie Handmade Glitter Circle Pins! Made by Liberty a graduate of Fine Art and based in Sheffield. 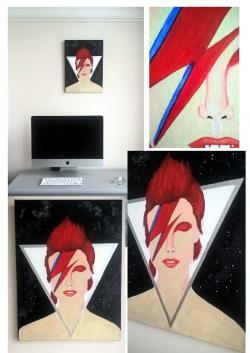 Liberty, loves making and sharing art with people that adore David Bowie! Made with a wooden heart then painted with vibrant colours. With added glitter! Finished with a thick layer of gloss glaze to give the pin a protective layer. Please note that the pins are not 100% waterproof. Minimum bid is £52 (Bid increments are £2). 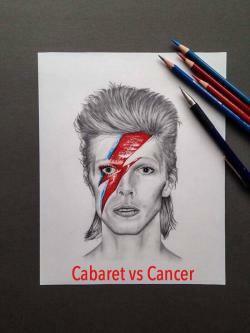 This original artwork by cabaret sensation Jo Foley is inspired by her dad's record collection. Minimum bid is £140 (Bid increments are £5). 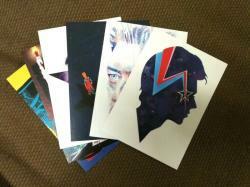 This is a UNIQUE opportunity to own a complete first edition print run of thirty-five A3 Bowie Prints, by incredible artists. Thanks to 9th Sentinal, who have donated these 35 full-colour exclusive prints - which have been gathered together for the first time! With a market value of over £800 this is your opportunity to own something very special. Minimum bid is £102 (Bid increments are £2). Carter is an Australian ex-engineer living in London creating and carving images in to the natural flowing fibers of engineered wood. 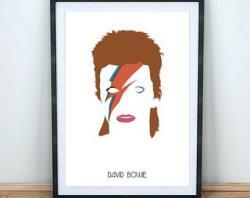 This A4, Ziggy minimalist print is a wonderful item printed on 200gms paper to a professional standard. 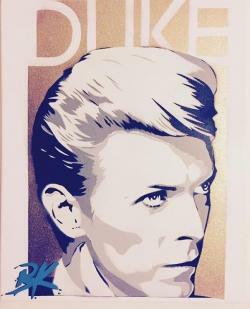 Open edition hand-pulled screen print by Bold and Noble of English singer, songwriter Bowie. This auction is for TWO items!! Minimum bid is £28 (Bid increments are £1). A tribute to the late great David Bowie. 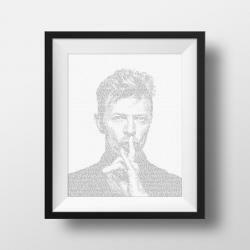 This print is inspired by 20 of his greatest studio albums. It chronicles the years from his self titled debut album up to his last studio production - Black Star. 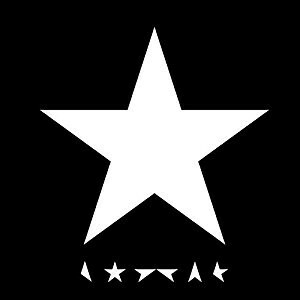 Underneath is written David Bowie 1947-2016. The item is a brand new A3 size (297mm x 420mm) unframed Limited Edition colour art print, created using the latest commercial digital technology. Printed onto high grade matte acid free archival quality 200gsm art board, the print run is limited to just 150, each print is individually hand numbered on the reverse. Minimum bid is £41 (Bid increments are £2). This OOAK Baseball hat has been hand decorated by guinness-world record holder and cabaret performer SNAKE FERVOR! This brand new baseball hat has been decorated with crystals to create the iconic Bowie logo! Your chance to win a ONE OF A KIND baseball cap! 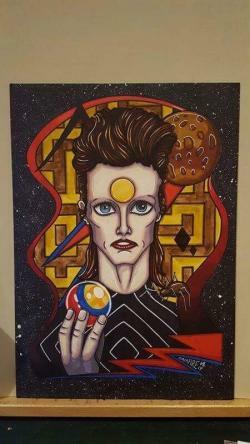 Bowie by Dennis Brown, from Laindon Essex. 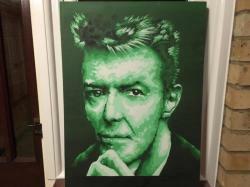 This one off piece is 27 and a half inches by 19 and a half, using acrylic.s. Minimum bid is £7 (Bid increments are £1). 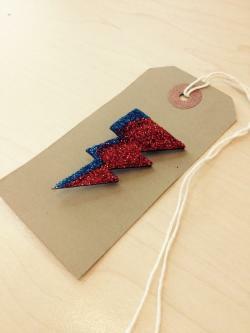 This badge is blue and red glitter, approx 5cm tall. Minimum bid is £72 (Bid increments are £2). This one-of-a-kind piece has been made by International Award Winning Burlesque Performer and Costumier Vicky Butterfly. No two are the same. 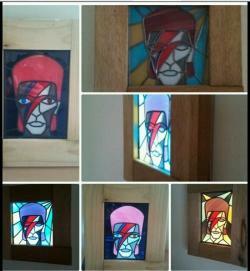 This auction is for the 'ziggy' period image in a light frame with eyes closed. 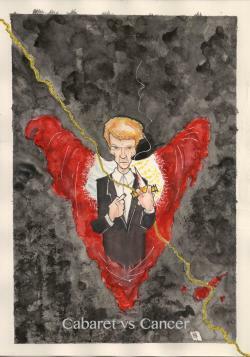 Illustrator and storyboard artist, Jon @field's graphic style is influenced by comic book art. 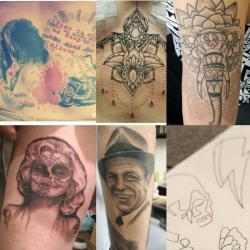 He is inspired by friends and performers in the burlesque and cabaret scene, who often feature in his work. Minimum bid is £17 (Bid increments are £2). 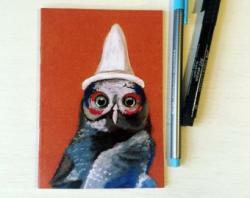 A3-size (420 x 297mm) giclee print on semi-gloss art paper. Handsigned by the artist. Minimum bid is £47 (Bid increments are £2). Ben Kanduth is a London based pop culture stencil artist. Full time comic book enthusiast and pop art admirer.